Iraq has a strategic and effective position in the world as it represents a crossroad for the different routes connecting the world continents and a land bridge leading to naval communication routes. Iraq is important on both international and commercial levels. The capital of Iraq is Baghdad. The country consists of eighteen Provinces, three of them, Al-Sulaimanyah, Erbil, and Duhouk, constitute Kurdistan Region, whereas Basra, Mosul, and Erbil are considered the principal Provinces due to the large areas and large number of population they enjoy. Iraq's main resources are oil, natural gas, sulfur, phosphates, iron, red mercury, kaolin clays, bauxite, limestone, gravel and sand. 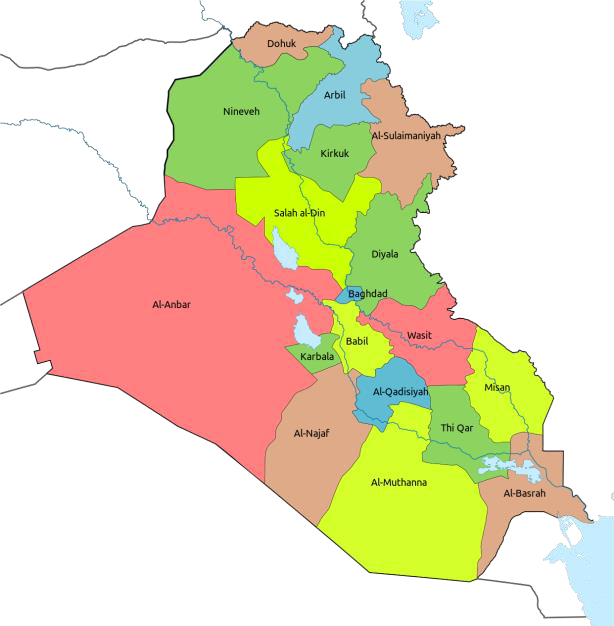 Geographically, Iraq can be divided into four main areas: the Western Area, the Southern Area, the Mountain Area, and the Sedimentary Plains Area on the Tigris and Euphrates. The area of the country is about (438,446) km2. The population of Iraq is about (38.8) million, 19.6 m male and 19.2m female. Most of them live in urban areas. Iraq has two main rivers which are Tigris and Euphrates, whose lengths are (1850 km) and (2350 km). Both of these rivers rise in Turkey and meet in Al-Qurna City in Basra Province to form Shatt Al-Arab which in turn flows for another (185 km) before reaching The Arabian Gulf. Iraq borders; Turkey to the north, Saudi Arabia, Kuwait and Gulf to the south, Iran to the east, Syria and Jordan to the west. Oil plays a vital role in the development of Iraq's economy as it contributes to GDP about 60% in fixed prices for the year 2015, and 62% in fixed prices for 2016, and about 32%in GDP for 2015 in current prices in oil sector while it was around 29% for 2016 (according to primary astimation from MoP) and more than 90% of financial revenues. Oil sector has achieved a significant rise in production as the conducted researches showed that crude oil production had a noticeable rise during 2015 as it increased from (3.7) million bpd to more than (4.1) million bpd in 2016. Gas proven reserves is 130.9f³ trillion and potential reserves is 31f³ trillion. Iraq has large potentials and competitive experience in sulfur-related industries. It also produces significant amounts of nitrogen fertilizers and phosphate.